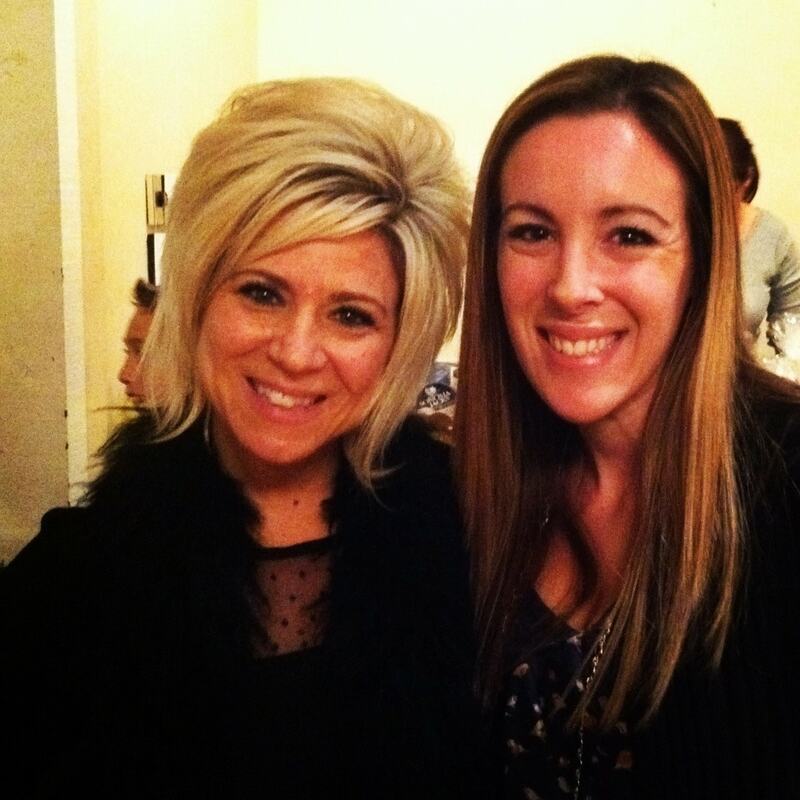 Last night, I spent an evening with the Long Island Medium, Theresa Caputo. I attended a fundraiser dinner for the STEVEN PETILLO FIELDS OF DREAMS FOUNDATION. It was an amazing cause and close to my house, so I thought it would be a great night out with friends. Theresa Caputo – The Long Island Medium (one of my favorite shows)- was the talent so to speak. She walked in larger than life – her personality just as fun and vibrant as you see from her reality show. Everyone was very excited to see if she would pick them for a reading. As SOON as I heard that first story, I started to repeat over and over in my head, “Don’t pick me. I don’t need it. Anyone who wants to talk to me – GO AWAY. Now is NOT the time. I DON’T NEED IT” – almost like a broken record. There were so many families who lost their babies… I cannot imagine that heartache. I cried so HARD last night and I cried for 2 hours straight. The loss that was suffered in the room was too much to handle. I always joke to friends and say that I’m an empath because I am SO sensitive to emotion. Well, last night I went to sleep with a MAJOR migraine because of how many tears I shed. I know people don’t believe in this sort of thing… and this post isn’t intended to bring up any religious debate. But I will say this – everyone left last night with a sense of calm instilled in them. Life does go on. Our loved ones are still with us and they are at peace. It was a beautiful thing and I was so happy to have been part of it. I know I mentioned a few months ago that I reached out to Theresa Caputo’s people and asked to be placed on her list. I think the wait is around 3 years or so. When it comes up, I will still most certainly go (if I don’t have to mortgage out my house) but I almost don’t need to anymore. Everyone is ok. Everyone is waiting for us. Everyone surrounds us with love. While I didn’t get a personalized message, that one came through loud and clear. Theresa truly has a gift. Is Theresa Caputo A Fraud? Listen, a lot of people have emailed me over the years asking if I think that Theresa Caputo is fake or a fraud and I just don’t think so. I sat there and watched her walk around the room talking to one person to the next and knowing the smallest of details. Could she be wearing a piece in her ear? I don’t know. Maybe. I mean – I suppose ANYTHING is possible. I’m from NYC. I have trust issues. But, I don’t think that’s what is going on. I don’t think Theresa Caputo is being fed any information. I really do think that woman has a gift. I can’t say – first hand – because I never had a personal reading. But I did sit in a room for several hours and see people collapse with love and hope and joy. Theresa Caputo is a real medium. I really think it’s true. Awwww Vera. Before I found God, I remember wanting to see a physic just to hear from my MIL. She had been taken so quickly from us, without notice, and it was hard on me and the whole family. But now that I know God, I’m at peace. I know she’s waiting on us and that’s she’s okay. I can feel her letting my heart know that there was a purpose for the way it all happened. Anyways, I know what you are saying and how it feels to you Vera. We are all lucky to have someone like you in our lives, with such a loving heart. Keeping it real, I can only say that I am very envious. I wish I’d been there. I wish I’d gotten a message. I love her show! I read that she has a two year waiting list and isn’t taking any more appointments. That’s great for her! Seems she’s referring people to other mediums since her waiting list keeps growing and growing. I hope to get a reading with her one day! So neat! I love Teresa and I love her show but I don’t think her gift is one that is exclusive to her. I think that we can all “tap in” to the spirit world. Personally, I only want to be “open” enough to allow for great intuition but I’m glad that there are people like her who will share with us. Teresa is a very special, warm hearted, loving woman.You can absolutely tell how beautiful she is on the inside.Her kids need to fix all the meals though. Lovely story. And yes, of course you are an empath. You may want to find someone to take a class with, to learn about how to not take on so much of other people’s energies. Or if you do, how to clear them out of your system so you won’t get another migraine. As much as I love, love, love Teresa, there are so so so many wonderful mediums out there. I was on Doreen Virtue’s website, where she lists people who have taken her training, and happened to find a wonderful psychic/medium right in my own town! And she is very affordable, very talented, easily available and what comes through her is always loving, helpful, and timely. I too wrote about my experience watching Theresa in action (Unfortunately from the TV like most everyone else!). I like your outlook – if people feel better and it’s not costing them more than they can afford, who cares if it’s real or not. Religion has a “blind faith” aspect to it. The masses don’t question THAT! I’ve looked all over and cannot find where to get my name on the list to be read by Teresa Caputo. What website did you go to, or what phone number did you call? Thank you! I cannot believe you have a blog and have to many errors. What do you have against the letter “h”? Theresa AND psychic. I know we all make mistakes but how do you claim to be such a “fan” and can’t even spell the womans name? when using the word “to” as in to many; is’t actually “too” (two “o’s”). People in glass houses shouldn’t throw stones. This is amazing. Really makes you think about what you believe in and reminds you that no one is ever truly taken away from us and we will be reunited with them one day. Why do we believe is this person. God is the most powerful of all. This women is a soul who is lost. Does she pray?, does she go to church? Who is her savior? It is not our Lord Jesus! She is lost and so are those ho trust in her. Go to our Lord ! K, God also tells us to not Judge one another, I think he’d be o’k with someone helping bring peace, comfort closure or whatever you want o call it.. I’m not going to tell you that there’s probably more important things one could post because we all have our right to our own opinion as long as its not harming or being disrespectful to one another. Or judgemental of course! I have watched the show and have mixed feelings. She may be a fake and in the Bible people who claimed to have these types of powers (the woman that followed Paul around for a day or two in the New Testament, who was used to tell fortunes by her owners; for example) are not seen in a good light. On the other hand she brings comfort to people which can’t be bad. But does she ever see a soul in hell? I wonder. Because otherwise the message is that everyone goes to heaven which is comforting but not biblically correct. That could make a very impressionable person think being without God was OK and that would be a horrible mistake. Still, I find I like her. However, I take show to be more about being entertained than anything else. My wife and I last week saw Theresa Caputo in Cerritos, California. Almost one year ago we lost my first child, 4-year-old Jax, to a drowning accident. I was born and raised in the Christian faith and question whether or not her gift is of God. My struggle with faith and what I experienced at her show can be found here http://smilingthroughtearz.com/shattered-faith/ and http://smilingthroughtearz.com/shattered-faith-part-ii/. Anyway, I don’t know what to believe. I’m just trying to seek truth. I know what I saw, and she has a gift. The Old Testament has a lot of anti-mediums text, but the New Testament is completely different. Anyway, it is an experience to see Theresa do her work. I have not been able to get to see Theresa Live, but I have a friend that went. She says it was just awesome and if its a trick its pretty good. I do watch her on TV and love the program, almost each week I’m in tears. Guess I would have to be read to be a true believer but I’m close! My sister and I attended her show last Saturday night; she was kind, warm and authentic. It was obvious that she utilizes her gift for good and embraces it as a service from God to help others. Theresa was exhausted by the end of the show and so was the audience. It’s very intense, emotional and healing. A feeling of calmness, understanding and gratefulness came over me and I would venture to say most others, too. So many people in the audience had heart shattering events take place in their lives and we were glad they got the relief from their readings to begin healing, from Theresa. We just miss our Mother immensly. It also was obvious that this channeling takes a lot out of Theresa and she’s a tiny woman. The messages and stories also were a lot to take in; totally believable just very intense. I am a practicing Catholic and so is she. The bible and its’ stories are important; however, there have been so many translations it cannot possibly be 100% accuratee. Every individual soul should be responsible enough to make choices in their lives and strive to be the kindest and loving person to each other as possible. No judgements! All famous psychics are all fakes and scam artists. They charge outrageous prices and just want big money and fame. Theresa Caputo the Long Island Medium, all she does is cold readings. You know a medium is fake when they constantly ask you questions instead of statements. Check out youtube videos of her, Sylvia Browne, etc. under “cold readings”.